Next Page For Top 10..
Congratulations on graduating! It's an exciting time in your lives and you should celebrate! 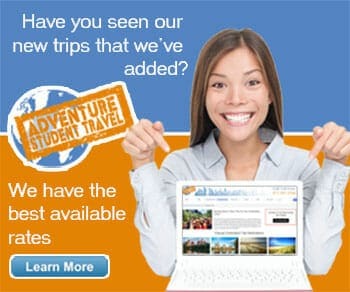 After all your hard work, head out on a grad trip for a little R&R, thrilling fun, and to discover something brand new. You certainly can't go wrong with the City of Angels, where the weather is always warm and the beach is always nearby. Trips to L.A. are packed with touring Hollywood, Griffith Park, Universal Studios and of course Disneyland. You also have the option of doing a more cultural tour of neighborhoods like Koreatown, Japantown, and Little Armenia or heading directly to the beach to plant your feet firmly in the sand. A perennial favorite of graduating seniors, Myrtle Beach is affordable, family-friendly and exciting. The boardwalk is the most popular attraction with its amusement park attractions situated directly on the beach, calling all carnival lovers. There's also the waterpark at the opposite end of the boardwalk, plus Broadway on the Beach, live music performances, fireworks every Friday, and even the Myrtle Beach NASCAR Speedway. Though it can be expensive and it's far, Honolulu is the ultimate destination for grad travel. Absolutely stunning and situated perfectly in the curve beneath Diamond Head crater, Honolulu is at once exotic and familiar. The historic attractions including Pearl Harbor, the USS Arizona, and Iolani Palace are incredibly popular though many people head out to Waikiki Beach and relax their vacations away in the surf. A Floridian beauty, Tampa is fantastically attractive. On the warm waters of the Gulf Coast, Tampa's beaches are always hopping with activity though you might find yourselves drawn to the inland attractions. Tampa has its own Busch Gardens theme park combining a zoo and theme park rides, plus nearby Lowry Park Zoo, Big Cat Rescue, and Florida Aquarium for animal lovers. The Henry B. Plant Museum in the old Tampa Bay Hotel is another gorgeous attraction combining history with international art and architecture. This southern belle is phenomenally beautiful from the drooping and languid oaks to the perfectly preserved antebellum homes lining landscaped squares. Savannah is one of the best planned cities, easily navigable and toured by foot. Go from the lovely shops and scenery of River Street over to Bay Street and visit the Masonic Temple and Moon River Brewery and then over a few more streets to see the famous Forsyth Park. Take a ghost tour of the city for unexpected fun and thrills! What grad trip list would be complete without New York? With five boroughs, centuries of history, and the highest population of any city in the U.S., New York is one of the ultimate choices for any vacation. There is so much to do, you only have to choose if you want the traditional sites or the hidden gems. Do a blend of both and stop by the burgeoning borough of Queens for a getaway within the city or spend some time touring Brooklyn. Whatever you do, make sure you try some delicious New York pizza and authentic Italian food. The Bay City delights visitors young and old with the fantastically scenic vistas, curiously captivating attractions, and fascinating history. Tour the hills on foot and get some exercise or go down to Fisherman's Wharf and see the sea lions at Pier 39. Hop on a ferry and visit the historic prison of Alcatraz or relax with a tour of the spectacular Golden Gate Park, complete with views of the Golden Gate Bridge, Pacific Ocean, and plenty of park attractions. Another southern belle makes the top 10 list! New Orleans, aka the Big Easy, continues to bring in the tourists year after year for her joie de vivre, delicious food, and vibrant French Quarter. Start off your trip with breakfast at Cafe Du Monde with some cafe au lait and beignets, then stop by the French Market, Jackson Square, a tour of the St. Louis Cathedral, and then make your way down to Bourbon Street. See voodoo shops and museums in action, take a ghost tour of the allegedly haunted city, and stop by the comprehensive Audubon Nature Institute and Zoo. Florida just can't quit giving us vacation-perfect destinations. Fort Lauderdale is fun in the sun along the southeastern coast of the state, offering up the cultural vibrancy of The Strip, relaxation of the palm tree studded beaches, and the history of a number of lovely mansions. The city has been a vacation destination for decades, and you'll see why when you step foot in the southern Florida sunshine and tour the stunning state parks, museums, and taste the fresh seafood at the best restaurants in the city. If you're looking for laid-back atmosphere, Fort Lauderdale is just the ticket. Finally we come to the last destination on the list, Chicago. The Windy City is known for its bustling activity and attractions like the Navy Pier and the Magnificent Mile shopping strip. During the warm summer months, stop first in Grant Park where you'll encounter the Art Institute of Chicago and then head to the largest indoor aquarium at Shedd Aquarium, and the Field Museum of Natural History where you'll see the largest intact T-Rex skeleton, Sue. End out your day with a visit to the Navy Pier and have a blast at the amusement park rides, attending a concert, and more!